All The Merry Year Round is an exploration of an alternative or otherly calendar that considers how traditional folklore and its tales now sit alongside and sometimes intertwine with cultural or media based folklore; stories we discover, treasure, are informed and inspired by but which are found, transmitted and passed down via television, film and technology rather than through local history and the ritual celebrations of the more longstanding folkloric calendar. However, just as with their forebears there is a ritualistic nature to these modern-day reveries whereby communal or solitary seances are undertaken when stepping into such tales via flickering darkened rooms lit by screens, although their enclosed nature is in contrast to more public traditional folklore rituals. Accompanying which with the passing of time some televisual and cinematic stories continue or begin to resonate as they gain new layers of meaning and myth; cultural folklore that has come to express and explore an otherly Albion, becoming a flipside to traditional folklore tales and sharing with them a rootwork that is deeply embedded in the land. In amongst All The Merry Year Round can be found wanderings down such interwoven pathways, travelling alongside straw bear and cathode ray summonings alike. Includes work by United Bible Studies, Circle/Temple (Dom Cooper of The Owl Service/Bare Bones/Rif Mountain), Magpahi, Cosmic Neighbourhood, Field Lines Cartographer, Polypores, A Year In The Country, Sproatly Smith, Pulselovers, The Hare And The Moon & Jo Lepine (The Owl Service), Time Attendant and The Séance (Pete Wiggs of Saint Etienne and James Papademetrie). “All the Merry Year Round creates an atmosphere for wandering and wondering. The set succeeds through counter intuition, its alternative calendar creating such a ruckus that it causes all calendars to blow away in the wind, leaving us only with the eternal, visceral now.” Richard Allen writing at A Closer Listen. “A Year In The Country… operating like some sinister rustic arts and crafts movement manifesting online via a Wi-Fi connected scrying mirror… an almanac of unearthly sonics to tide you through the winter nights.” Ben Graham writing in issue 74 of Shindig! magazine. In Part 2 of these posts I discussed some of the potential problems and reasons for them that have been related to Brutalist architecture, particularly in relation to its use in housing design; connected to which I mentioned the work of writer J. G. Ballard. His novel High-Rise (1975) is an iconic fictional account of extreme dysfunction that occurs in a modern tower block. In the book there is a vertical division of class within a tower block, with inhabitants who live on floors 1-9 being members of the “proletariat” and those who generally work in the support and service aspects of work/the creative industries. Above them is a commercial level and then higher up the middle classes, with the top five floors being reserved for the upper class which consists of “a discreet oligarchy of minor tycoons and entrepreneurs, television actresses and career academics”. Returning to the story told in the novel; in it the eponymous high-rise becomes a self-enclosed community where the normal rules and restraints of society break down, leading to internecine territorial conflict and chaos, which could be considered not dissimilar to an urban take on William Golding’s novel Lord of the Flies (1954) in which a group of schoolboys stranded on an island descend into violence and tribalism; both books explore the push and pull between human impulses towards civilisation and social organisation and more basic, primal instincts. “There is only one economic system in this world, and it is capitalism. Where there is state capitalism, there will never be political freedom.” Margaret Thatcher speech, as featured in Ben Wheatley’s High-Rise. In their use of a central triangular design the above set of above film posters for High Rise explicitly references the poster design for Stanley Kubrick’s 1971 film adaptation of Anthony Burgess’ A Clockwork Orange, with both films and books sharing views of dystopian futures where pleasure-seeking tips over into a reprehensible and unfettered decadence and loss of conventional morality. The above poster for High Rise on the left I think was released in the film’s pre-production period and at a time when I first became aware of the film after seeing it posted along with Ben Wheatley’s comments which went along the lines of “I can’t believe this is happening” – I assume after being given the go ahead from the folks with the money. The design of the tower block references the Brutalist architecture of the period when the novel was first published in 1975 and also appears to be a nod towards that period’s left-of-centre exploratory science fiction cover art, which was also referred to earlier in the post. To end this post on a note that is not all heavy cultural reference points etc, the other two posters are Lego toy construction brick recreations of the film’s posters by somebody working as Lego Loki. 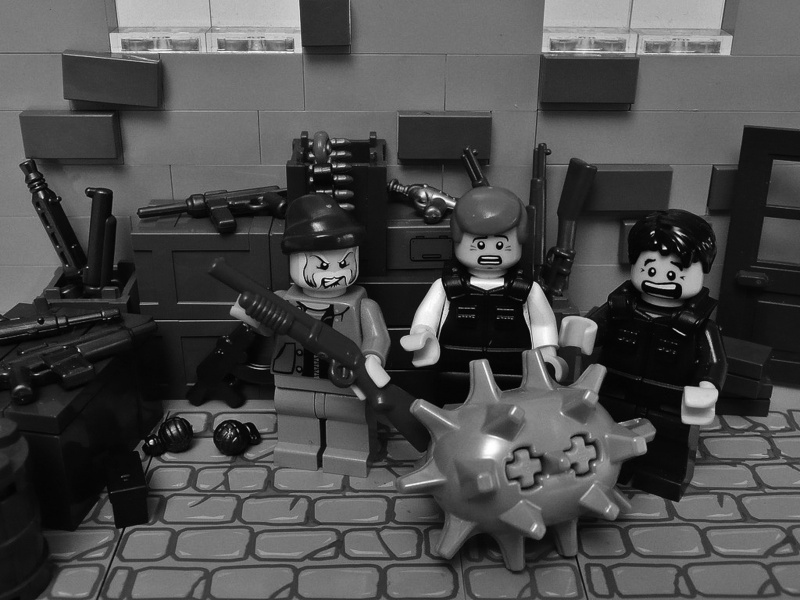 Although there now appear to be on the internet Lego recreations of nearly everything under the sun, due to Lego’s origin as a child’s toy, I was still a little surprised to find ones which took as their source material something as experimentally transgressive as High-Rise. Undercurrents was partly inspired by living in the countryside for the first time since I was young, where because of the more exposed nature of rural life I found myself in closer contact with, more overtly affected by and able to directly observe the elements and nature than via life in the city. This coincided with an interest in and exploration of an otherly take on pastoralism and creating the A Year In The Country project; of coming to know the land as a place of beauty, exploration and escape that you may well drift off into but where there is also a sometimes unsettled undercurrent and layering of history and culture. I found myself drawn to areas of culture that draw from the landscape, the patterns beneath the plough, the pylons and amongst the edgelands and where they meet with the lost progressive futures, spectral histories and parallel worlds of what has come to be known as hauntology. Undercurrents is an audio exploration and interweaving of these themes – a wandering amongst nature, electronic soundscapes, field recordings, the flow of water through and across the land and the flipside of bucolic dreams. “The countryside is often over romanticised, ususally by those who don’t live there. A Year In The Country has dug a little deeper and hit on something much more profound to end up, if you’ll excuse the pun, in a field of his own.” Ben Willmott writing in Electronic Sound magazine. “…the chimes of a music box, the creak of a gate, the rush of the wind, the crackle of static, the turning of pages. Cathode hiss and transistor hum from the bottom of the lake.” Dave Thompson writing at Spin Cycle / Goldmine. Valuation of materials for their inherent qualities “as found”. At first glance it might seem a little strange that Brutalist architecture seems to sit easily amongst “otherly pastoral” cultural interests; a point of conjunction is that both share a sense of “Fall” from an imagined or lost golden age. With the appreciation for Brutalism this could be seen as a hauntological yearning for lost progressive futures, which relates to the architectural form’s connection to and some of its roots being in utopian socially progressive thought; in terms of post-war British social housing the intentions behind it were at times an attempt to create a solution which could provide modern high quality housing for the general populace. In terms of folk culture this utopian aspect connects to what author Rob Young described in his book Electric Eden as folk/visionary pastoral culture’s yearning for “folk memories of an unsullied rural state of mind which now appears like a golden age” and the way in which relics from a world before an industrial “Fall” are revered, with old buildings, texts, songs etc becoming “talismans to be treasured, as a connective chain to the past”. Brutalist orientated social-housing in Britain could in part be seen as a well-minded grand social experiment. Unfortunately as mentioned before at A Year In The Country when writing about Peter Mitchell’s book Memento Mori (which focused on the controversial and now demolished Quarry Hill Flats which were built in the 1930s with a progressive intent to house people in a modern manner as part of “a great social experiment” and which could be seen as an antecedent to later Brutalist estates) there often appeared to be “bugs in utopia” in terms of related housing projects. In particular, where despite the progressive intentions of those who championed and worked to create such projects, in practice a number of instances the resulting buildings it failed to provide fit homes. To a degree there seemed to be a divide or remove between “a romantic outsiders’ intellectual sense of the importance of building communities within and via large-scale, flat orientated modernist social housing projects” and the human needs and realities of those who would live there. Some of that philosophical remove is reflected at points in an ever-growing library of books and publications, proliferation of websites, social media accounts etc which focus on an appreciation of Brutalist architecture more in an aesthetic sense and/or directly or indirectly in terms of how it represents lost progressive futures and alternative pathways society may have taken rather than its real world failures. The observations in this piece on that sense of remove are not necessarily a criticism. Alongside a purely aesthetic appreciation there is often a sense within Peter Chadwick’s book This Brutal World (2016), which I discuss below, Jan Kempemaers’ images of Cold War Spomenik memorials which are collected in his 2010 book of the same name and Christopher Herwig’s 2015 book Soviet Bus Stops, of recording and honouring the remaining and caught in time but slowly fading away monuments and relics of a former age’s lost future. Many of the structures featured in such books are visually striking physical examples of relatively recent history’s striving and aspirations and taken as a whole there is space within such work for both aesthetic and more socially rooted appreciations and studies. This Brutal World collects the author’s photographs on this subject which, along with his accompanying introduction, reflects his passion for and longstanding commitment to the subject. It is a handsomely produced and curated book in which Chadwick’s images portray the striking nature of many of these structures in a visually graceful and well observed manner. It is resolutely not a study of the social disfunction and neglected aspects of some Brutalist designed social housing but rather a celebration of its aesthetic explorations. Brutalist architectural housing and residential structures are an aspect of This Brutal World, it does not focus on such projects when they have “failed” and are in a state of neglect, abandonment etc. Residential structures are also only one area amongst structures built for a multitude of purposes that are featured in the book, which take in amongst many others places of worship, water and satellite towers, monuments, a music study centre, municipal buildings etc. Text in the book talks of the “awe-inspiring” and “once heroic, visionary” nature of such architecture and the buildings and structures are photographed and presented in a way which captures what some may consider to be their beauty; even when the skies are overcast the structures appear well lit and few of the buildings are shown marked by rain or decay. Also the photographs are all monochrome, which in this instance tends to remove the more oppressively grey aspects of concrete buildings. As a collection This Brutal World is more orientated to being an appreciation of the aesthetic and philosophical design aspects of Brutalist architecture rather than its in part socially progressive history; related utopian aspects are acknowledged in the introductory text but the author’s writing and quotes by others which are featured in the book, alongside the aforementioned visual grace of the photographs, are more an expression of his appreciation for Brutalist buildings, monuments etc as abstract creative structures rather than as architecture which had both aesthetic and utilitarian worth. Hence he mourns the demolition of buildings which were unpopular, unsuited to their environment and poorly maintained. Viewed today many of the structures featured in This Brutal World could be seen as a form of retro-futurism (which is a sometimes defining aspect of hauntological aesthetics and interest); they are a literal physical representation of the shape of the future’s past. From The Furthest Signals takes as its initial reference points films, television and radio programs that have been in part or completely lost or wiped during a period in history before archiving and replication of such work had gained today’s technological and practical ease. Curiously, such television and radio broadcasts may not be fully lost to the wider universe as they can travel or leak out into space and so may actually still exist far from their original points of transmission and places of creation, possibly in degraded, fractured form and/or mixed amongst other stellar noises and signals. The explorations of From The Furthest Signals are soundtracks imagined and filtered through the white noise of space and time; reflections on those lost tales and the way they can become reimagined via hazy memories and history, of the myths that begin to surround such discarded, lost to view or vanished cultural artefacts. Includes work by Circle/Temple, David Colohan, Sharron Kraus, A Year In The Country, Time Attendant, Depatterning, Field Lines Cartographer, Grey Frequency, Keith Seatman, Polypores, The Hare And The Moon, Pulselovers and Listening Center. Above is the review of the album in Electronic Sound magazine. This is Part 2 of a post on Edgar Wright’s film Hot Fuzz. Part 1 can be visited here. In Part 1 of this post I wrote about how Hot Fuzz referenced and was an affectionate home to American action buddy copy films such as Point Break, the Bad Boys and Lethal Weapon series of films (and also mentioned how Wright says that he originally pitched it as Rural Weapon). Alongside it referencing such films, there is a strong nod towards what has come to be known as folk horror, in particular The Wicker Man (1973); in both films a priggish outsider policeman attempts to solve a mystery in a rural community where something untowards may be afoot and is lead on a merry dance by its inhabitants. 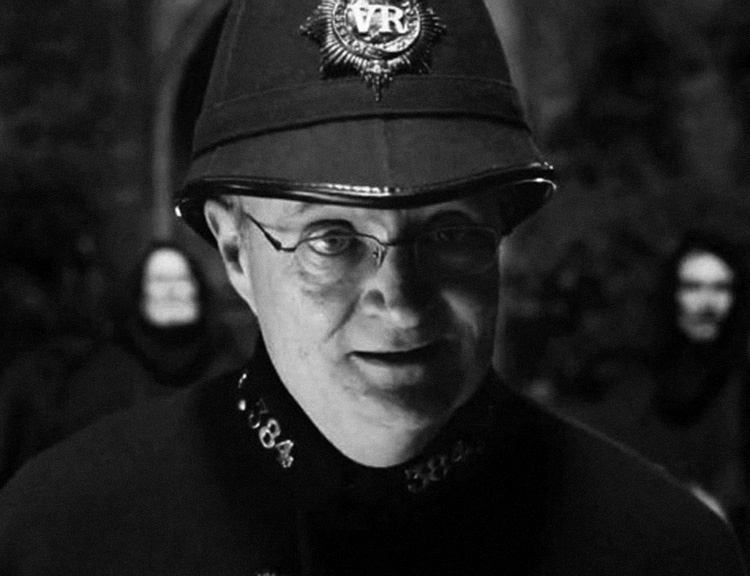 This connection is made more implicit by the presence of Edward Woodward in Hot Fuzz, in his second to last cinema role. In The Wicker Man Woodward played the priggish policeman Sergeant Howie who was investigating the rural folk on the side of the law and (to his mind) societal decency. This is stood on its head in Hot Fuzz as he is involved in the murderous conspiracy and is eventually shown as the last living rogue villager when near the film’s end he bursts into the police station and attempts to shoot Angel. He is foiled but accidentally activates a sea mine which Angel had earlier confiscated along with an arms cache from a villager. He is killed and the station is destroyed in a manner that in seems to bring to an end or close the circle of a story cycle in British cinema. 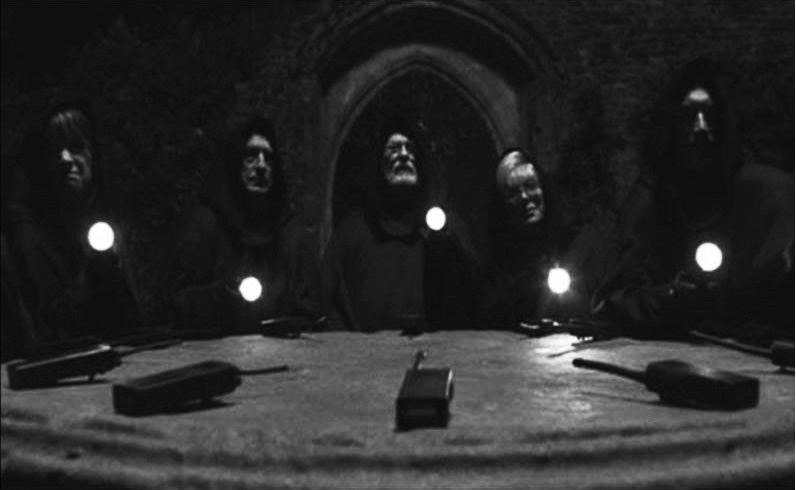 The film also has nods towards 1970s British horror, in particular that era’s portmanteau films and interest in witchcraft and the occult; ultimately the murderous conspiracy is shown to be the result of the actions of an essentially morally corrupt/very misguided village organisation (the Neighbourhood Watch Alliance or NWA – a humorous reference to and contrasting with the American urban gangster rap group). When Angel visits a secret NWA meeting they appear to be nearer to a coven or cult as they have gathered at night in black shawls and hoods around a stone table in a castle. However they still retain a curious friendly neighbourhood committee air as they discuss their dastardly deeds, which is mined for comic effect. In a further connection to 1970s horror the death/murder of a journalist who is planning on revealing information about goings on in the village by falling church masonry also seems to reference such things in The Omen (1976), wherein a priest who is attempting to reveal secrets is killed by a lightning rod thrown from a church roof during a storm. While the film also references Hammer Horror-esque gothic films when Angel flees the NWA and falls into a catacombs filled with the bones and dead of those they have killed. Although to my knowledge not openly referenced by Hot Fuzz’s director or co-writers the film also shares some territory with an episode of the remake of television series Randall and Hopkirk (Deceased) which was broadcast on British television in 2000-2001. 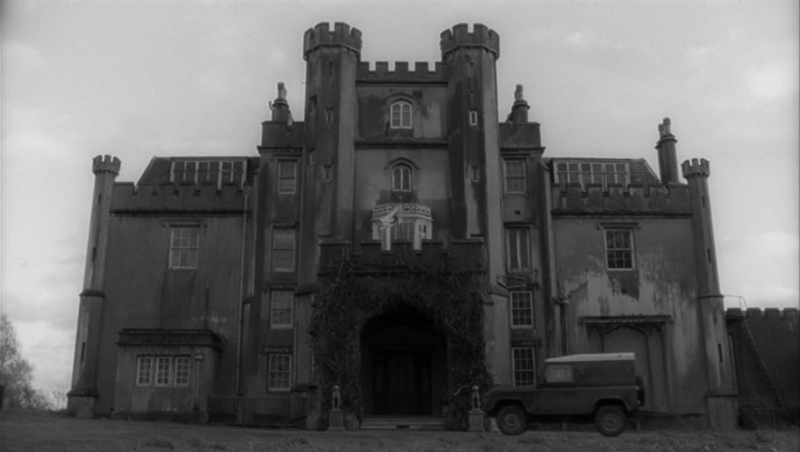 In particular the episode Man of Substance which also tells of a sleepy country idyll gone bad and is rather folk-horror like in its plot which tells that its population have been trapped in between life and death, unable to leave the village since the days that a pestilence had caused the demise of a considerable percentage of the English population a number of centuries previously. As with Hot Fuzz this episode (and others in the series) is in part an affectionate homage to previous era’s horror and genre cinema, particularly in relation to folk/rural aspects of such work. At the NWA meeting the head of the local police Inspector Frank Butterman, Danny’s father in the film who is played by Jim Broadbent, is shown as being one of the instigators of the conspiracy in a thoroughly misguided attempt to honour his wife’s memory and her wish to keep the Village of the Year title. In contrast to Nicholas Angel his uniform appears to be nearer to that of an earlier era. This subtly unsettles expectations and norms as in a rural setting such a figure summons a sense of an avuncular “good old British bobby” and a previous gentler way of life rather than the mayhem over which he has presided. As in The Murdersville episode of television series The Avengers, which I have written about at A Year In The Country previously and also The Wicker Man, Hot Fuzz flips the chocolate box idyll of the British village and rural communities on its head and shows them to be the “unknown” or other; a threatening and deceitful group closed and separate to the outsider or city dweller, with ways, morals and motivations that appear foreign and at a far remove from mainstream and urban society’s mores. 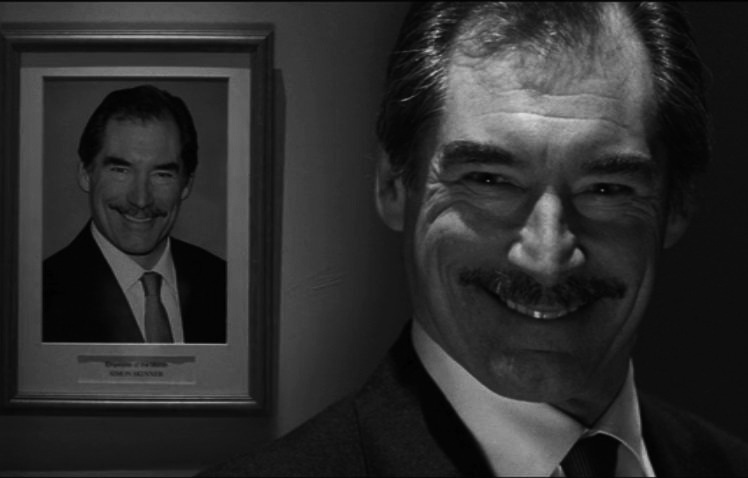 Hot Fuzz’s reversing of expectations and settings is further heightened when in a climactic scene Angel pursues and fights another of the conspiracy’s prime instigators ocal supermarket manager Simon Skinner, played by former James Bond Timothy Dalton, who is the film’s resident arrogant bad guy. This scene takes part in a symbol of gentle Britishness – a miniature model village – with Angel and Skinner towering over the buildings and seeming nearer at points to giant battling monsters that might be found in science fiction/fantasy films. As with similar sequences in such films their fight leads to the literal destruction of whole structures, although here they are the small-scale replicas of the model village rather than say actual city skyscrapers. After his first defeat and mirroring many such multiple returns of the bad guy in American genre film Skinner rises back up and attempts to attack Angel with a small plastic handled box-cutting knife rather than say a machete or similar weapon that might be seen in its overseas equivalent. The use of this prosaic and relatively small weapon along with the general wrongness of the setting of a pitched violent battle in a model village heighten the sense of the out-of-place nature of such actions amongst a bucolic idyll. Which would seem an apt point on which to end this post. The Restless Field is a study of the land as a place of conflict and protest as well as beauty and escape; an exploration and acknowledgment of the history and possibility of protest, resistance and struggle in the landscape/rural areas, in contrast with sometimes more often referred to urban events. It takes inspiration from flashpoints in history while also interweaving personal and societal myth, memory, the lost and hidden tales of the land. References and starting points include: The British Miners Strike of 1984 and the Battle Of Orgreave. Gerrard Winstanley & the Diggers/True Levellers in the 17th century. The first battle of the English Civil War in 1642. The burying of The Rotherwas Ribbon. The Mass Tresspass of Kinder Scout in 1932. Graveney Marsh/the last battle fought on English soil. The Congested Districts Board/the 19th century land war in Ireland. The Battle Of The Beanfield in 1985. Includes work by Field Lines Cartographer, Vic Mars, Bare Bones, Assembled Minds, Grey Frequency, Endurance, Listening Center, Pulselovers, Sproatly Smith, Polypores, Depatterning, Time Attendant, A Year In The Country and David Colohan. Hot Fuzz is a British made buddy cop action comedy film released in 2007, directed by Edgar Wright and co-written by him and its lead actor Simon Pegg. In the film over achieving London police officer Nicholas Angel, played by Pegg, who takes his work very seriously, is relocated to Sandford, a place which initially appears to be a typical sleepy quaint British village. However things are not as they seem and Angel and his colleagues are soon embroiled in a murderous conspiracy by prominent members of the village who are intent that no matter what Sandford will continue to win Village of the Year; cue fellow villagers and visitors who may get in the way of that being sent to their demise via the likes of large-scale explosions, tumbling masonry, and decapitation in a car accident. 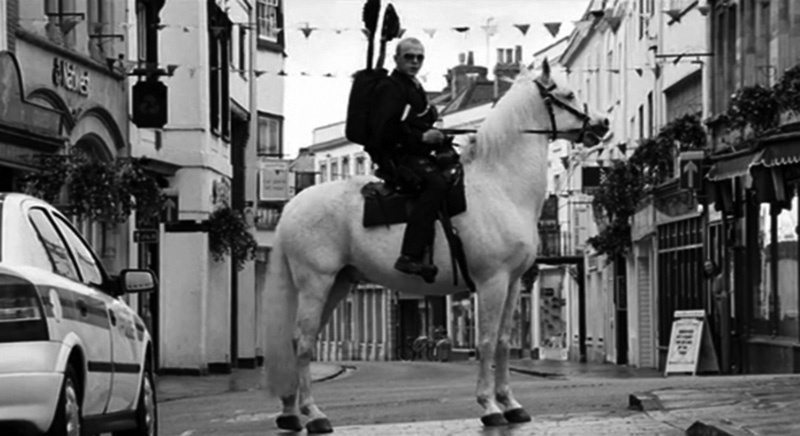 In Sandford Angel is presented as somebody who is somewhat out-of-place after the hustle and grittier experiences of city policing, something which is heightened by his wearing of modern protective police wear and equipment despite him being likely to need it in the general peace and calm of his new surroundings. This is also in contrast to his new police duty partner Danny Butterworth, played by Nick Frost, who at least until the later action sequences, is more likely to be seen wearing a woolen policeman’s jumper and in both character and appearance is possibly nearer to the idealised image of the classic friendly British country policeman. Butterworth is portrayed as a quite sweet, gentle, good-hearted soul but also as somebody who, in a similar manner to the film itself, is enthralled to the classic American buddy cop action film, the glamour of the shoot out and the chase etc and also more than slightly in awe of this “big city” newcomer and his metropolitan experiences. Edgar Wright has said that he wanted to make a cop action film because unlike much of the rest of the world at the time Britain did not particularly have a tradition of such cinema – although to a degree it did on television via the likes of gritty police drama The Sweeney (1975-1978). 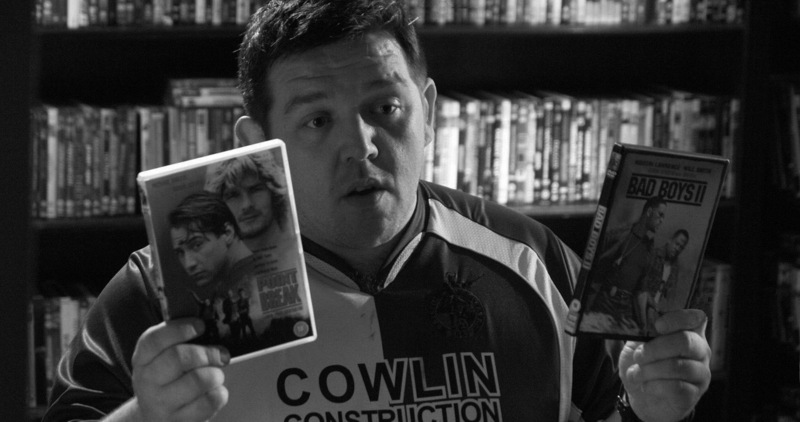 There have been a long line of American buddy cop action films such as Point Break, the Bad Boys and Lethal Weapon series of films etc (the first two of which are explicitly referenced in Wright’s film and he has said that he originally pitched the film as Rural Weapon) and as with many of such films at the heart of Hot Fuzz is the relationship between the contrasting characters of two “buddy” police officers, in this Angel and Butterworth. Hot Fuzz transfers Hollywood action and cop movie aesthetics to a British rural setting and makes direct and indirect references to such American films in an often humorous manner but it is not so much a parody, spoof or satire of them but rather an affectionate homage and seems to hold its source material in high esteem. 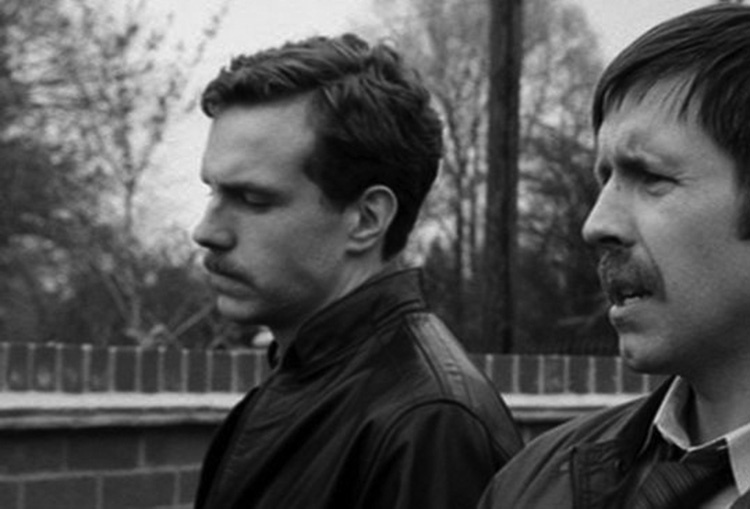 Despite the relatively high production values, special effects and so forth, in some indefinable manner that is separate to its setting and characters Hot Fuzz retains a sense of being British drama – there is a subtle awkwardness to it that seems to reflect a film industry that has never fully embraced the flash and spectacle of Hollywood style cinema. Connected to which there is a curious disconnect when watching an at times all out action film of this type set in a British village, its local supermarket etc and on seeing American style action, heroics and gunplay undertaken by British policemen, with much of the film’s humour and character being derived from the appearance and use of the trappings of wider cinema’s action cop films, such as chases, fight scenes, automatic weapons and explosions etc in the unexpected setting of a rural British village. 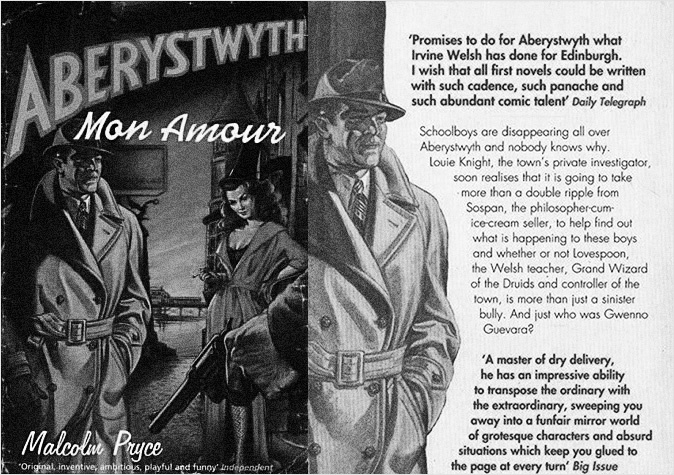 In this sense it shares some territory with Malcolm Pryce’s book Aberystwyth Mon Amour, which depicts a modern-day parallel world version of the Welsh seaside town Aberystwyth but which is run by druids who are essentially to all intents and purposes actually “gangsters in mistletoe”. Alongside referencing American buddy cop action comedy films Hot Fuzz also makes a more than cursory nod towards other genres including Westerns and previous British horror and folk horror films, in particular The Wicker Man, The Omen, gothic Hammer Horror and even giant monsters on the rampage in the city films. The Forest / The Wald is a study and collection of work that reflects on fragments and echoes of tales from the woodland and its folklore; greenwood rituals performed in the modern day, fantastical childhood rhymes, sylvan siren calls that tremble through tangles of branches, electronics pressed into the summoning of otherworldly arboreal creations unearthed amidst the creeping thickets and elegies to woodland intrustions, solitudes and seasons. Includes work by Bare Bones, Magpahi, Polypores, Time Attendant, David Colohan, Sproatly Smith, The Hare And The Moon ft Alaska, The Rowan Amber Mill, The Séance with Lutine, Cosmic Neighbourhood and A Year In The Country. Part 2 of a post about John Carpenter’s Christine. Visit Part 1 here. 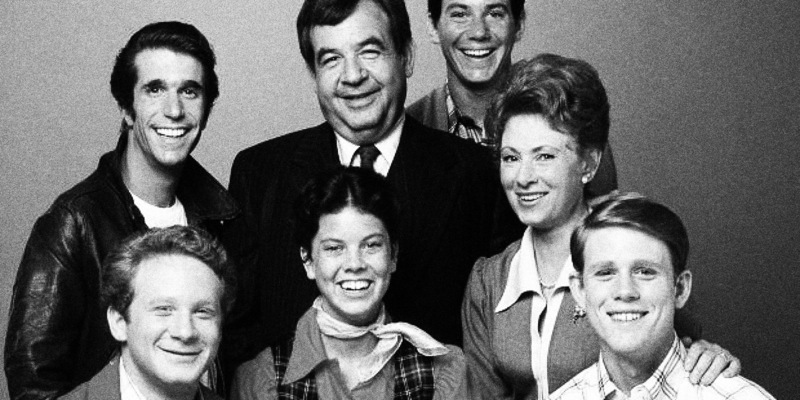 Although set in the late 1970s Christine in many ways appears to be nearer to what Graham Williamson on the website Geek Show has called “a kind of debased version of the sugar-sweet nostalgic sitcom Happy Days” (a popular television series set in the 1950s and broadcast from 1974-1984) particularly when two of the main teenage leads go to school and have to deal with flick knife wielding bullies. 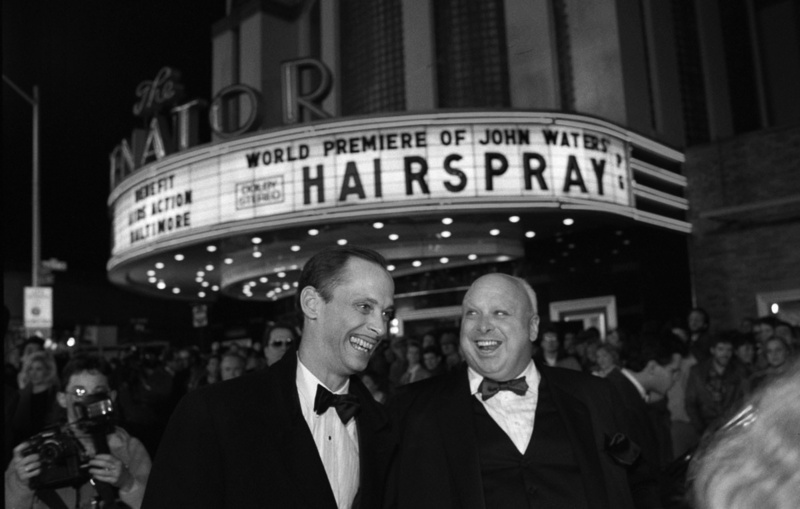 While not as overtly camp nor comedic, in this sense it could be seen as treading not all that dissimilar territory to John Water’s 1950s/early 1960s set films Cry-Baby (1990) and Hairspray (1988), which took some of the themes, tropes and aesthetics of earlier eras/rock’n’roll and filtered them through a period almost cartoon-ish and at times degenerate teenager and/or status quo baiting lens. However in Hairspray although the teenage lead Tracy Turnblad horrifies and rebels against her parents and some of her schoolmates when she begins an interracial romance, overall she is shown to be a good citizen who is working towards social good and integration. In Christine Arnie develops a more classic “Yeh, what y’gonna do about it?” defiant teenage stance in response to his parents’ wishes and attempts to control him; while more of a loner, this attitude along with his new 1950s-esque bad-boy style and swagger has him heading towards the outsider rebel rock’n’roll-isms of Johnny Depp’s gang of “drapes” in Cry-Baby. 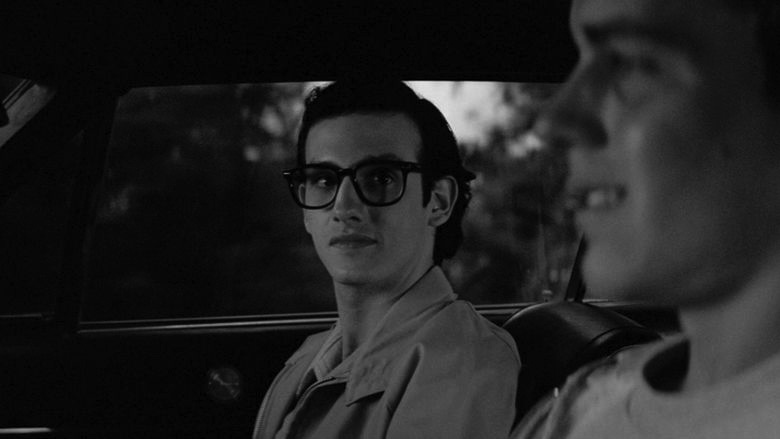 As part of this youthful rebellion in Christine cars are shown as being autonomous zones away from parental and societal influence, something which was effectively enabled by America’s affluence at the time. These are mobile spaces in which to strut your stuff, make your mark on the world and make out with your partner. The sense of being at a remove from authority figures and 1950s period aspect of the film are also further shown by one of the key scenes in the film taking place at a drive-in cinema, a location which seems to inherently invoke a sense of a previous era. And although the film’s location takes place in an anonymous suburb there is a sense of it containing unregulated fringe areas and characters from the edge of society; Christine is bought from an older man who’s shack-like home in an overgrown patch of waste strewn scrubland and general grizzled demeanour could well have tumbled out of some mythological Southern State of America, while the garage in which Arnie repairs Christine seems to be an unregulated edgeland which is often only shown at night and ruled over by its owner who is played as a tobacco chewing, foul mouthed and unkempt, borderline grotesque character. 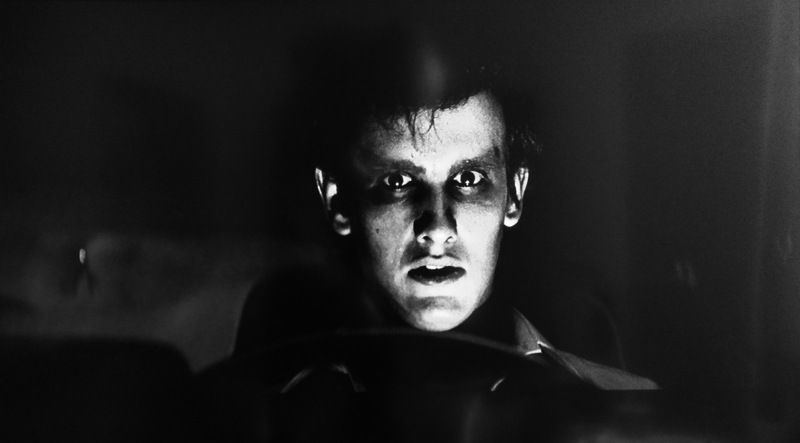 One aspect of Christine which seems in marked contrast to early 1980s trends within cinema is that Christine is almost the antithesis to the slasher movie; for the first hour or so of its running time the film is nearer to a coming of age film, with murder and mayhem, along with the supernatural aspects, taking a decided “backseat” and throughout the film there is very little gore or overtly graphic onscreen violence. In this sense it sits alongside some of John Carpenter’s other earlier films such as The Fog (1980), which had a distinctly chilling atmosphere but created and sustained this without more obvious graphic visual scares and special effects. 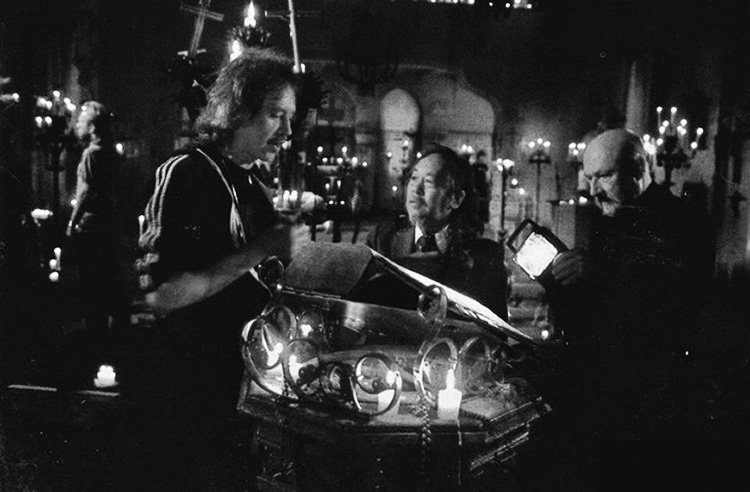 The pace, plotting and action in both films and also in the likes of his Prince of Darkness (1987) when compared to much of modern cinema tends to be relatively more slowly paced (although notedly without feeling like a “slow” viewing experience) allowing the viewer’s mind and imagination time to breathe and look around rather than bombarding them with endless action and a montage of edits/cuts in an attempt to keep the audience in a state of heightened stimulation and excitement. The character John Stockwell in the film is Arnie’s closest friend who initially attempts to protect his outsider/uncool schoolmate. Their relationship is a little unusual in the sense that it does not fit with American film tradition; John is a popular, good looking athlete, a “jock”, complete with an iconic letterman jacket. Arnie is the boy who has his lunch stolen by the bullies. However, in a reversing of their normal social roles, for much of the film John is effectively neutered as he is bed bound in hospital due to a sporting iinjury, his football playing days over. As he recuperates Arnie’s power appears to grow, he becomes the (slightly unconvincing) cool one of the friends and begins to date the attractive new girl at school. In this sense for a while Christine is almost a classic American teen film; the geek becomes the cool kid and gets the girl as the cool kid goes out of favour – although in contrast to much of such genre cinema the cool kid is portrayed as a good guy and more the victim of misfortune, rather than being the arrogant popular member of school society who gets his comeuppance. Ultimately though the normal balance of power is restored; the uncool kid who has risen up through being corrupted by the supernatural powers of his car has become arrogant and swollen by his power. He looses his sense of normalcy and decency and this in part leads to his demise, while the neutered “jock” cool kid eventually rises again; his actions are aimed at stopping the car’s murderous impulses and its sway on his friend. However although he does not know how complicit Arnie is in the car’s violence, he is ultimately implicit in his friend’s demise as he and Arnie’s former girlfriend band together to bring down Christine in an almost climactic showdown in the garage where she was restored. Although not made overly implicit there is a sense towards the end of the film that the naturally good looking and popular athletic friend is the one who will be left as the romantic partner with the good looking popular girl (i.e. Arnie’s once girlfriend). And so the natural order is finally restored. While the film has a slight workmanlike quality to it (John Carpenter took it on as a job of work after the commercially and critically negative reaction his previous film The Thing received on its release in 1982), as with the 1950s cars that feature so heavily in it Christine stands the test of time rather well. This may in part be due to the way in which it deals with universal themes such as love, jealousy, ugliness, beauty, rites of passage and so forth. 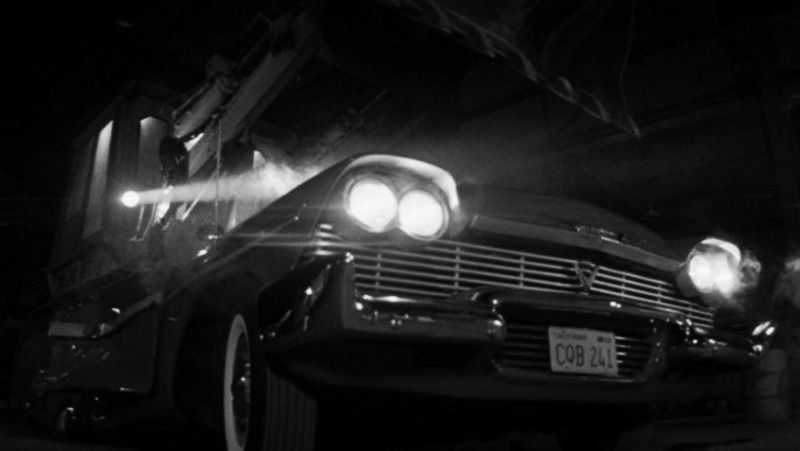 Accompanying which the special effects are still impressive today; when Christine restores herself and literally pushes back out her dented bodywork this was done in a real world manner using pneumatics and so forth and the end result are visuals that more than hold their own with modern-day CGI. That the effects were carried out by apparently just ten people, as shown in the credits, makes them all the more impressive, particularly as today similar computer generated effects would probably require multi-columned credits of dozens of people. Released today 8th March 2019. Downloads available at Bandcamp, iTunes, Amazon etc. No More Unto The Dance is a reflection of nightlife memories and the search for the perfect transportative electronic beat; a collection of reverberations that have fragmented with the passing of time. It is a document of life once lived in the very heart of metropolises, immersed in their subcultures: a time that was predicated in part by a passion for club culture, dancing, dressing up and related explorations carried out with the obsession, enjoyment and energy of youth. Much of that gradually (or sometimes not so gradually) faded away or took other pathways. The world in which this recording was made does still come alive at night but it is more likely to be the nocturnal foraging and wanderings of wildlife rather than in a low-ceilinged basement lit by a strobe light. The music presented here is the soundtrack to those basements, filtered through the looking glass of a life far removed from the bright lights and big city, the dressing up and dancing but a memory – a world far, far apart, almost that seems to belong only to the worn and aged pages of a faded, forgotten magazine. The journey it takes envisions a mixtape of memories and echoes of those pages, of 12”s bought because of the primal rush their electronics would bring on when listened to in a record shop, the lucky dip of unknown records bought hopefully from the racks of bargain basements, the more abstract/triphop beats to be found in intriguingly designed/obscure sleeves and to times lost in the seemingly endless dreams of a club; a time when the future burned with the brightness, optimism and idealism of youth. Audiological Transmission #40​/​​​​52​​: No More Unto The Dance – When Did It All Break? First up is Chris Lambert’s A Year In The Country – Spectral Fields – Wyrd Kalendar Mix 3, which is an hour and a half or so mix of music and film etc samples that explores the themes of the Wandering Through Spectral Fields book. It is the third in a series of mixes with this one focusing on Chapters 27-39 of the book. The mix can be listened to at Mixcloud here and details can be found at the Wyrd Kalendar site. It segues Roger Whittaker’s theme song for the apocalyptic film No Blade of Grass (which if you just read the lyrics should be terrifying but it’s easy listening delivery makes it, possibly accidentally, almost humorous)… into the actually terrifying unsettling choral music by Christopher Gunning produced for the 1981 British television adaptation of John Wyndham’s Day of the Triffids… and then onto samples from the 1960 film adaptation of his Midwich Cuckoos renamed Village of the Damned… into a traditional style instrumental folk song which accompanies Jeremy Deller and Alan Kane discussing there Folk Archive work, which collected contemporary folk art from everyday life… and then into Johnny Hawksworth’s Industria-Go-Go, an uptempo library music track from 1970 released by library music label De Wolfe which I think at the time, in order to help potential users, was given the descriptive tag “Energetic, movement”… and well, that’s just for starters. The mix also takes in work by MacGillivray, Vashti Bunyan, Anne Briggs, The Owl Service, Audrey Copard, Watersons, David Cain, Howlround, Classroom Projects, Kate Bush, Jonathan Hodge, Pierre Arvay, John Williams, COI, Magpahi, Jane Weaver, Paper Dollhouse and The Eccentronic Research Council. A fine piece of work – humorous, unsettling, inventive, exploratory. Chris Lambert is an author who has worked on/written various books including Tales from the Black Meadow and Wyrd Kalendar, which included illustrations by Andy Paciorek (who also works on Folk Horror Revival and Urban Wyrd) and which was accompanied by a CD that included music by amongst others Widow’s Weeds, Keith Seatman, Emily Jones, Beautify Junkyards, Concretism, The Soulless Party and The Rowan Amber Mill. Which brings me to the “What is hauntology? And why is it all around us?”, a short film/documentary made by the BBC Archive which serves as a concise overview of some of the recurring themes of hauntological work, its background, some of those whose work has been labelled as hauntology etc and in part takes it inspiration from some of the topics discussed in the A Year In The Country: Wandering Through Spectral Fields book and related text. With a brief description that describes it as considering “From TV to art to design – why a ‘nostalgia for lost futures’ seems to be everywhere” and an appropriately 1970s and sometimes degraded television transmission aesthetic the film interweaves archival television footage with explanatory text and appearances from philosopher Jacques Derrida who coined the phrase hauntology, the darkly humorous artwork of Scarfolk, public information films, The Changes, Look Around You’s askew take on television science programmes, Ghost Box Records, the Play for Today drama Robin Redbreast, Clay Pipe Music, hypnagogic pop and a fair bit more. Well worth a visit and look-see… What is Hauntology? can be viewed here. The BBC Archive’s What is Hauntology? Around the early to mid 1980s there was a trend in American television for the vehicle to be the “star” and/or central premise of the show, including the series Street Hawk (1985), Knight Rider (1982-86), Airwolf (1984-1987) and Blue Thunder (1984). Generally the star vehicles, which included a motorbike, a car and two helicopters, were technologically advanced and used by the forces of good against the bad guys to variously uphold law, order and justice. Although to a degree they are fetishised – in the sense of being objects which while technology orientated have an almost magical ability to protect and aid their owners/users – only the car in Knight Rider is overtly anthropomorphised. However while possessing a form of artificial intelligence and appearing quite human through its use and understanding of spoken language and its almost gentle persona, at heart it is still only a machine, a piece of advanced technology. 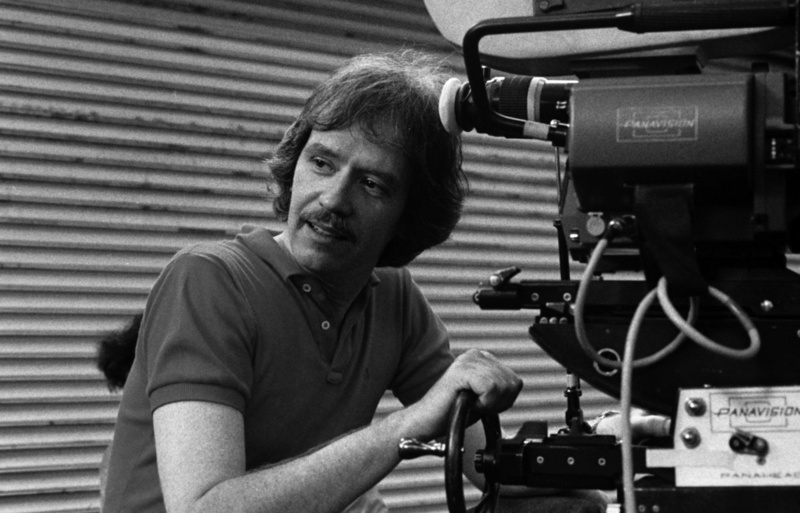 In marked contrast is John Carpenter’s 1983 cinema adaptation of Stephen King’s novel Christine, also originally published in 1983. Set in 1978 it tells the story of Arnie, a teenage misfit/school outsider, who buys and restores a 1958 Plymouth Fury car named Christine, which while essentially technically just another assembly line car turns out to be unexplainedly possessed and have a will and mind of its own and is bent on destruction, revenge and the complete unquestioning devotion and corruption of its owner. The car is filmed in such an aesthetically appreciative manner that it could well be taking notes from Kenneth Anger’s fetishistic (in both the attributing magical powers and sexual sense) Kustom Kar Kommandos short film from 1965, in which a young man gently and lovingly buffs an already gleaming customised hot rod. That film is soundtracked by the Paris Sisters’ version of Bobby Darrin’s late 1950’s love song “Dream Lover” – which provides a further aesthetic connection between the films as Christine’s radio only plays 1950s rock’n’roll. As Arnie restores the car to its former head turning, chromed and red painted glory, it also acts in a manner which reflects both the above meanings of fetish; the car becomes Arnie’s one true sweetheart, trumping and competing for his feelings over his actual girlfriend. Until very nearly the end of the film it is not clear whether Christine is acting independently when she drives and hunts down her tormentors or whether Arnie is at the wheel as one half of a murderous couple; he is not seen entering or leaving the car before such actions, has an alibi to show he was elsewhere, each time she undertakes such an act her windows are blacked out so the viewer cannot see if there is a driver at the wheel and to further confuse matters at one point Christine is shown to autonomously attempt to deal with her competition and do away with her Arnie’s girlfriend. It is only once Arnie truly commits emotionally to Christine that the car appears to also fully reciprocate and its super/preternatural abilities become more overt, which happens after the school bullies have smashed her almost beyond repair. Arnie is shown facing her and in highly sexual/emotional manner says “Okay. Show me.” At which point there is a classic John Carpenter soundtrack synth stab and the car literally flexes her muscles and miraculously restores her bodywork and “sensuous” curves back to normal. Although an inanimate object rather than conventionally alive Christine appears to have a brooding malevolent and evil presence and her apparently autonomous actions are generally predatory. 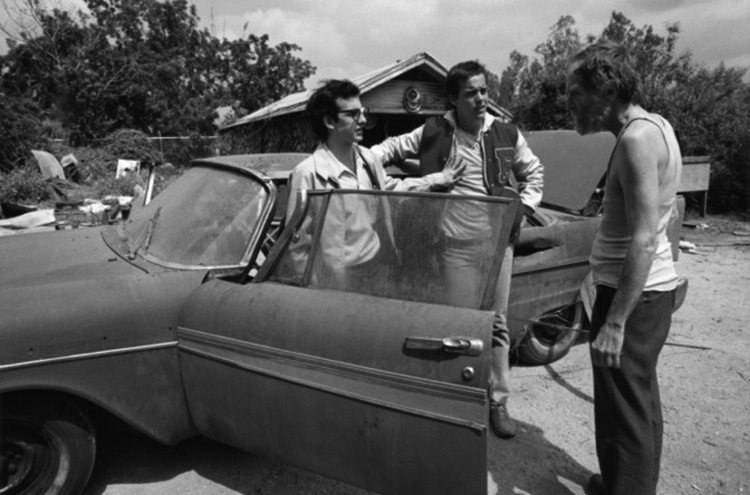 As there is no backstory in the film which explains the car’s possession (there was in the original book but it was removed for the script), its sentience and autonomous abilities appear to be nearer to a form of unexplained magical realism than to be rooted in the supernatural. At the start of the film the car is shown on the assembly line, just another car, albeit more vibrantly painted in striking red next to the other car’s beige. That the car was “born” a bad seed is depicted as she assaults one factory worker, trapping his fingers in her bonnet and most probably murders another who does not treat her interior with respect and that is as far as any source of her possession is explained. As previously mentioned Christine’s radio only plays a previous era’s status quo worrying devil’s music via its radio (i.e. 1950s rock’n’roll). This association between the car’s malevolence and a particular era’s music reflects a difference from contemporary cultural nostalgia for the 1980s, which often tends to look back with a certain rose-tinted, selective starry-eyed affection. Christine’s look towards the 1950s seems to take a considerably more darkly refracted view of an earlier period and to ultimately reject related nostalgia; after going on a murderous spree Christine is eventually crushed and apparently defeated, although she appears to have one last breath and statement in her as “Rock and roll is here to stay” keeps playing even when the radio technically must have been destroyed. The final line in the film after the car’s apparent destruction is “God, I hate rock’n’roll” but at the very end there is a slight movement from Christine, possibly indicating life and perhaps suggesting that the sins and sinfulness of rock’n’roll is indeed “here to stay” – although a sequel was not forthcoming, so this has been left open ended. Well, this post may initially seem like something of a “cuckoo in the nest” at A Year In The Country but there are lines and points of connection with the likes of Mo’Wax, UNKLE, Tricky, Massive Attack and the spectral hauntological, otherly interests that are generally found around these parts, including The Delaware Road events. James Lavelle, the founder of record label Mo’Wax and the band UNKLE has talked about “creating your own universe”, something which he has often done in his own work with say UNKLE’s Psyence Fiction album from 1998 seeming to belong to and spring from a wide-ranging and almost epically cinematic created and self-contained world of distinctive illustrations, multiple variations of bespoke packaging, physical artifacts such as toys and conceptual underpinning. That sense of creating your own universe is essentially what often happens within hauntological and the further reaches of folk work; whether that be the parallel world created by Ghost Box Records or the form of “imaginative time travel” (to quote Rob Young from his book Electric Eden) that was carried out by folk music and culture explorers in the 1970s when they appeared to be attempting to create and/or drawing from an imagined historical and cultural folkloric landscape that never existed in the “real” world. As I have referred to at A Year In The Country before, the distance from the abstract instrumental hip hop/electronica or “trip hop” for which Mo’Wax is particularly known is not all that far removed from and has various lines of connection with some hauntological orientated music. Hauntology forebears Boards of Canada often utilise instrumental electronic breaks and beats that are not that dissimilar in terms of their downbeat, more abstract nature from those that may have been found on a Mo’Wax release in the 1990s and Ghost Box Records artist Belbury Poly collaborated on the 10″ Further Navigations, an “exploration of the ancient Harrow Way, the ‘lost’ road of Southern England”, with The Memory Band and Grantby aka Dan Grigson, the latter of which had a track on Mo’Wax compilation Headz 2 released in 1996. Alongside which if looked at in a more purely musical/audio basis rather than as part of a hauntological cultural landscape then the whimsical spectral work of Moon Wiring Club and its use of downbeat electronica, beats and samples could well have been found on a label such as Mo’Wax contemporary and also trip hop-esque/abstract electronica label Wall of Sound in the 1990s. While former Mo’Wax released artist Andrea Parker, alongside Daz Quayle, has gone on to produce the Private Dreams and Public Nightmares album (2011) which reinterpreted the work of electronic music pioneer, BBC Radiophonic Workshop member and hauntological point of reference and inspiration Daphne Oram. Lines of connection could be drawn from the likes of Oram’s pioneering explorations in electronic music and much of the electronic based music mentioned in this post – without her work and that by the likes of Delia Derbyshire (and possibly the futurist electronic pop of Kraftwerk) this post and some of the music and culture it discusses may well be rather different. To further draw lines of connection between this (rather) loose cultural landscape, in 2019 Andrea Parker is also to be one of the performers at The Delware Road: Ritual and Resistance two-day festival organised by the Buried Treasure record label, which takes place inside a military base near Stonehenge, an event at which “artists will perform work inspired by landscape, myth, broadcast propaganda and the transformative nature of sound”. The line-up for the festival draws from what could be called the confluence between otherly pastoral/hauntological work and also includes a number of performers etc who work in such areas including Paul Watson, Front & Follow, Kemper Norton, Sarah Angliss, Simon James, Revbjelde, Castles in Space, The Twelve Hour Foundation, Concretism, Polypores, Alison Cotton, Ian Helliwell and Radionics Radio. The DJ Food records have generally been released on the label Ninja Tune, which was founded in 1990 by some of the collaborators who have worked on the DJ Food releases and in terms of aesthetic and musical styles – abstract instrumental hip hop etc – it has released music which has at times explored some similar cultural territory as Mo’Wax releases did in the 1990s. Alongside appearing at a previous Delware Road event, in recent years Strictly Kev, working as DJ Food, has also co-created the Further events in London, which have featured performances and audio-visual DJ sets from some of those who work in similar hauntological cultural territories as The Delaware Road: Ritual and Resistance event and/or are appearing at it, including Howlround, Ghost Box Records and Simon James of Black Channels. Further interconnecting things as DJ Food he has also organised and performed at the O is for Orange events, the second of which was a Boards of Canada influenced live event featuring a montage of music, found audio and psychedelic imagery. 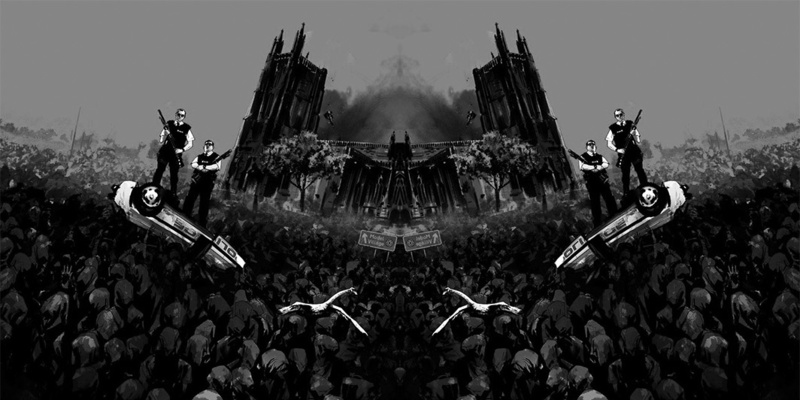 Trip hop has become something of a dirty or uncool genre description that is often used fairly narrowly to refer to music that came after Portishead’s first album Dummy in 1994 and as a description it sometimes refers to music which possibly overly narrowly utilised Portishead’s template of downbeat hip hop drum beats and smoky female vocals. Here I use it as a shorthand to indicate a wider and loose cultural grouping and set of atmospheres that included the likes of the instrumental abstract hip hop beats of for example some Mo’Wax 1990s releases (possibly DJ Shadow – although I would say his Endtroducing album released in 1996 and his related work from that period exists more in a world unto itself, more on such things in a moment), the haunted noir of Portishead, the at times claustrophobic intensity and tinges of darkness of Massive Attack and the fractured paranoid wordscape introspections of Tricky. If revisited now the 1990s work of Massive Attack and Tricky sound in part like spectral British reinterpretations and reinventions of hip hop and rap culture; not so much a hauntological-esque misremembering but possibly work created as though it could only access its source material via a distant, out of tune, fading in and out shortwave radio or via darkened dreamscapes. In terms of existing in and creating your own universe, Tricky’s more recent albums such as False Idols and Ununiform also seem like something of a homecoming for him – he appears to have become more accepting of the possibility that his work exists in its own cultural space and the albums have a focus that in part draws from and references his own legacy and its self-contained nature, with some tracks directly referencing his earlier music in a self-sampling or almost Part 2 of an ongoing story manner. To a degree in the 1990s Tricky was marketed as a pop-star and had Top 20 hits in the UK etc but his appearance as a guest of pop mega-star Beyonce at the large-scale music festival Glastonbury in 2011 provides a striking example of just how far removed he is from the mainstream pop pantheon; he seems like a very alien or “other” presence in amongst the twirling backing dancers and Beyonce’s pop-grinding. Portishead’s work in the 1990s also to a degree draws from a distant view of hip hop musically but then combined it with an atmosphere that seemed to conjure an imaginary smoky late night noirish world, further echoing American source material (i.e. noir film, literature etc culture) but rather than being a retro retreading it created a new world all of its own – something of a recurring theme in this post it would appear. Aesthetically connecting such work to hauntology, the use of spectral aesthetics can also be found in Massive Attack’s more recent Fantom / Fantom 2 apps, whereby their music can be remixed by moving the device and its camera in order to cause the source audio to be manipulated into its own fractured spectres and creating quietly unsettling, shadowed and trail filled imagery of the app’s user. While some of the music produced in the 1990s by DJ Shadow, Tricky, Portishead and Massive Attack may have a melancholic air and as previously mentioned at times be accompanied by a form of paranoid introspection, this appeared to draw more from a consideration of personal feelings and/or in Portishead’s case an associated noirish almost fatalistic seeming atmosphere, whereas often in hauntological labelled work the sense of melancholia can be seen in part as taking inspiration from and being an expression of a personal-societal sense of lost progressive futures. Rather than having such an overt philosophical underpinning, Tricky, Massive Attack and Portishead’s use of vinyl crackling may be considered more as a result of aesthetic choices in order to create particular atmospheres and effects and it is not clear whether it was present in the vinyl records which they sampled or added afterwards. In DJ Shadow’s work the use of crackle in his recordings from a similar period is possibly more likely to have been both an inherent part of the way his records were created as soundscape collages built from old “found” records rather than, as in Tricky, Massive Attack and Portishead’s case, vocal lead songs which utilised samples and also serves as a reminder of this recording process, an acknowledgment and homage to the layers of recording history from which his tracks were built and its reconfigured spectral echoes. As with some hauntological work this use of vinyl crackle and referencing of the physicality of older analogue recording methods, as also commented on in Ghosts of My Life in reference to hauntologically labelled music, can often appear to “make us aware that we are listening to a time that is out of joint”. It instills a sense of the music belonging to a time the listener cannot quite place; one that was both contemporary in style and its production techniques but which also seemed to exist in an atemporal timeline of its own. Includes work by Circle/Temple, Sproatly Smith, Keith Seatman, Polypores, Listening Center, The British Space Group, The Hare And The Moon ft Alaska / Michael Begg, Time Attendant, The Rowan Amber Mill, A Year In The Country and David Colohan. The method of recording brings to mind tales of Delia Derbyshire running tape loops round the corridors of the BBC Radiophonic Workshop after most people had gone home, which seems a rather appropriate line of connection considering that Howlround’s first album The Ghosts of Bush was in part a tribute to Bush House, the now closed previous home for the BBC’s World Service and also the way in which Howlround’s recording techniques could be considered part of a lineage that connects back to the experiments of the BBC Radiophonic Workshop. In comparison with some earlier work The Debatable Lands features quite a heavy take on the Howlround sound, which at times brings to mind a form of accidental hazy pulsating and almost gabba-like techno (or “tapeloop techno” to use a phrase from the Howlround site). That sense of gabba-like tapeloop techno is particularly present on the track Black Path which with its crunching distorted industrial-esque beats could well have been found on an unmarked white label 12″ bought from the “Fringe & Experimental” section of an independent dance music record shop in London’s Soho a decade or two ago and which has mysteriously resurfaced via Howlround’s tape wrangling and channeling of recordings’ lost and hidden echoes on this album. Details on the album can be found at Howlround’s site and at the Touch Shop. Next up are the compilations Undulating Waters 1 and 2, released by Woodford Halse, which is a project created by Mat Handley who broadcasts the radio show You, the Night & the Music and releases music as Pulselovers. The two cassette and digital album releases could be considered a physical embodiment of the eclectic selections in the radio show and includes the flipside, undercurrents and sometimes hauntologically spectral sides of electronic, psychedelic, experimental and folk music. The albums are beautifully packaged and there is a sense of them being a particular labour of love; the slip cases are individually screen printed, die cut and indented, while the inner j-card is also indented and has a die cut “window” through which you can see the included collector’s card. Pulselovers have had a number of tracks on the A Year In The Country music releases and there is a further crossover with the Undulating Waters albums as they also feature various other contributors to the AYITC albums, including the likes of Spaceship, The Heartwood Institute, Polypores, Grey Frequency, Time Attendant and Field Lines Cartographer. These are joined by amongst others Revbjelde, Pictogram, House of Daggers, Floodlights, 62 Miles From Space, Boll Foreman, Panamint Manse and Midwich Youth Club, with design by Nick Taylor of Spectral Studio. The collector’s cards also feature text by Paul Bareham, which are short pieces of intriguing and enigmatic fiction that bring to mind the imaginary landscapes of Hookland and Rob Young’s swirling dreamscape fictional writing which was included in Belbury Poly’s album The Belbury Tales. “Trading under the name Woodford Halse, this new adventure into sound perfectly compliments the shows musical ethic / remit in so much as casting a deserving searchlight upon the secretive crooks and crannies of the expansive labyrinth of so sounds stationed on the outer edges of the various electronic / kosmische / psychedelic spectrums. As to the sounds, well pretty much keeping in with the retro / futuro vibe so in common with the likes of ghost box, café kaput, a year in the country, castles in space and of course, polytechnic youth, to name but a few. One for late night attention methinks, ‘Undulating Waters I’ features twelve tracks gathered here for your discerning listening ear, a few names familiar a few not so, guaranteed a little something for all…” (Quoted from a review by Mark Barton, writing at The Sunday Experience). If you should appreciate the releases by the likes of Ghost Box Records, Castles In Space, Polytechnic Youth etc which are mentioned in the above text by Mark Barton then I expect you will find much to enjoy in these Woodford Halse releases. Or just if you enjoy wandering through the undercurrents and “crooks and crannies” of contemporary music while also appreciating creative album packaging and design as you explore. Visit Undulating Waters 1 and 2 at the Woodford Halse Bandcamp page here. Visit the You, the Night & the Music radio show’s archive here, Pulselovers Bandcamp page here and The Sunday Experience reviews of the albums here and here. Then we have Rowan : Morrison’s album In The Sunshine We Rode The Horses. “…this is a beautifully packaged yet somehow understated album destined, it seems, for ‘lost classic’ status, to be rediscovered and cherished by generations of pilgrims on the old straight track. Somehow we think they would approve.” (Quoted from a review of In The Sunshine We Rode The Horses at Terrascope). The mention of A Play For Today in the album’s notes provides a line of connection with The Book of the Lost that was co-created by Rowan, working as Rowan Amber Mill with Emily Jones, which is also a themed concept album, taking as its inspiration an imagined set of lost folk horror movies and which was an early reference point for A Year In The Country’s own wanderings. Visit Rowan : Morrison here, The Rowan Amber Mill here, The Book of the Lost here, Miller Sounds here and the Terrascope review here. And finally there is Grey Frequency’s fourth full length album release Ufology. It is described as “an audio exploration of British UFO sightings from the second half of the twentieth century” and each piece “focuses on a specific encounter from UFO folklore and reinterprets it as an excursion in unsettling sound and atmosphere”. The album’s focusing on UFO encounters from previous decades, the use of the phrase “UFO folklore” and the images of period suburbia and UFO sightings on vintage film stock/slide mounts that accompany Ufology seem to connect it with a hazy hauntological long-ago and now semi-forgotten sense of previous decade’s interest in such phenomena. In part the album could be seen to connect with a heightened interest in unexplained, super and preternatural phenomena during the 1970s in sections of society and accompanying coverage in the mainstream media, press, book publishing etc. This is a period Ufology at times draws from as one track mentions 1977 in its title, while The Dechmont Woods Encounter appears to refer to a UFO incident in 1979, although the album also takes its inspiration from events ranging from the 1950s until at least the 1980s. The album can serve as something of an intriguing semi-obscured signposting to events which have become part of British UFO folklore, as searching for events that inspired it such as the track “You Will Improve Or Disappear” leads to the likes of a “British Roswell” where a small metal disc was discovered on Silpho Moor in 1957 and which some thought was of extra-terrestrial origin. It was alleged to have contained copper sheets with hieroglyphic markings, part of which was translated as meaning “You Will Improve Or Disappear” – hence I assume the track title on the Ufology album. Those who believed in its extra-terrestrial origins included Air Chief Marshal Lord Dowding, who apparently had an on ongoing belief that the object was extra-terrestrial and said he had personally examined it in 1959 and found it to be a “miniature flying saucer”. Thought by the UFO community to have been lost or deliberately scrapped, in 2018 sections of the disc were found to have been stored at the British Museum. The tracks on Ufology are built from “lo-fi drones, dark ambient textures, and cassette-looped field recordings” and as with much of Grey Frequency’s work they have both an experimental and accessible quality. I was particularly taken by The Dechmont Woods Encounter, in which undefined mechanical creakings and vaguely Forbidden Planet-esque noises link into subtly ominous pulsing sounds which seem to imply the approach of extra-terrestrial abductors, which are said by the man who reported it to have been part of the UFO event that inspired the track, before it segues into an “after the event” almost restful or drifting end section. Available on cassette and digitally, Grey Frequency’s Ufology can be found at their Bandcamp page here.